Day 5: Ekphrasis Post… WHAT? Ekphrawhatis? Ekphrasis… what the heck does that mean? That was my first question when I saw this prompt for today. So, of course I looked it up and here’s the definition, “a literary description of or commentary on a visual work of art“. So! Now that we are all on the same page… here’s my post for today… enjoy! The instructions for this posting was to go to flickr.com/explore and write a post inspired by the image. I searched and searched and searched for a photo that inspired me. I was getting frustrated over the whole thing when I realized I am way more inspired by pictures I already have… sometimes you just gotta rebel and do your own thing. 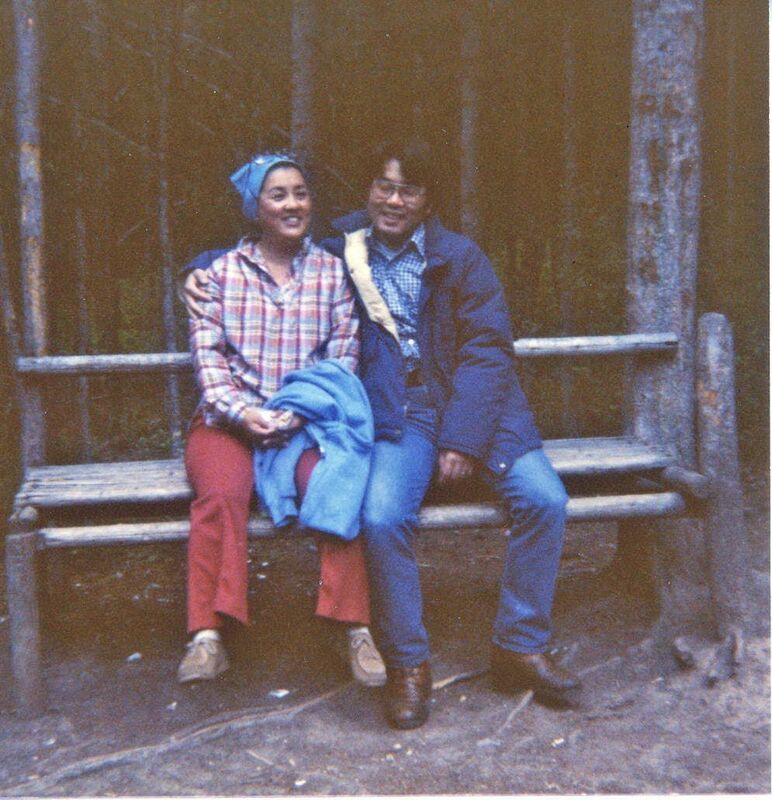 This picture is of my parents on one of our family vacations when I was growing up. It is one of my absolute favorites! Our vacations were spent in a cabin… no tv, no electronics. We played cards and read and just hung out together. Together. What a wonderful concept! Look at my mom’s feet. They don’t touch the ground!!!! I laugh every single time I look at this photo. They have been married over 50 years and that alone, is inspiring. Marriage is hard, or I should say… marriage is hard — WORK! That stuff in the movies is so romantic and funny and yes, sometimes, heart wrenching… marriage is some of that, but let’s be real here… it’s not a romantic comedy most days. Most days marriage requires work. Respect. Love. Trust. and for those of us with chronic pain, with depression, with any chronic health issue – marriage is not easy. The one with the health issues is struggling to get through each day while really trying not to be selfish/ self absorbed… the spouse is trying to support while not complain – in the end both are trying not to build up resentment. The healthy one for having to do everything, including being the relationship cheerleader and the unhealthy one for not having as much freedom as one would like. I am quite sure many marriages do not survive. I am blessed… I have my parents to look to for advice and inspiration and I have a beautiful, loving and supportive husband. This picture also inspires me with the desire to spend time with my husband and family doing things that don’t require spending a lot of money or even go too far. It makes me want to grab up my fam and go outside and take a hike or picnic. Most of all… this picture makes me smile and remember some really fun family times growing up. I hope my children have memories like this when they have their families. I want to be healthy and be able to go on family vacations and take long walks and swim and dance and run on the beach… managing my pain and mental health will, one day, get me there. Thanks for reading! Stay cool and pain-free. This entry was posted in blog, Chronic Pain, depression, exhaustion, Fibro, fibromite, fibromyalgia, foggy brain, HAWMC and tagged #HAWMC, Christian, Chronic Pain, Family, Health, Marriage, Mental health, relationship, WEGO Health. Bookmark the permalink. Loved the blog….your mom is so cute and you really touched on the important things that make a family.